Great Eastern Cutlery (GEC) specializes in highly collectable and premium quality usable pocket knives, hunting knives and kitchen knives. GEC is noted for it’s American craftsmanship and traditional hands on manufacturing methods and is located in Titusville, PA at the site formerly known as Cyclops Specialty Steel. The historic building is open to the public where you can observe skilled craftsman at work in a unique and panoramic manufacturing environment. These are highly crafted traditional knives handled with exotic hardwoods, North American cattle bone and Genuine stag. The jigging is also done on site in the GEC bone works. The blades of these quality knives are crafted from either high carbon steel or stainless steel and have tang stamps that include Tidioute Cutlery, Northfield UN-X-LD and Great Eastern Cutlery. The company also makes other knife brands on contract. The company’s higher end line is generally made with the Northfield trademark while its more affordable line carries the Tidioute trademark. The GEC brand is normally reserved for stainless steel bladed knives. Pattern Number Reference Guide This link will bring you to a list of most knife patterns made by GEC since the Company’s inception in 2007. You will find pictures & descriptions included for each pattern. Image Gallery Click here to view images that have been uploaded by AAPK members. Make sure to register & add some of your own. AAPK loves knife pictures! GEC Specific Knife Discussion Board This is a great place to chat about GEC knives. We welcome show & tell, Q&A, & much more. GEC’s First Knives : 2006 Click here to peak into history & view pictures & descriptions of the very first Great Eastern Cutlery knives ever made. GEC’s Second Year Knives : 2007 Click here to view production records & a short description of all of the 2007 stamped Great Eastern Cutlery knives manufactured. This is a comprehensive list. GEC’s Third Year Knives : 2008 Click here to view production records of all the 2008 stamped Great Eastern Cutlery knives manufactured. This is a comprehensive list. GEC’s Official Website Click here to visit the official home page of Great Eastern Cutlery. This is a great place to keep an eye on what is currently going on at GEC. They generally post information about what they’re currently working on along with short schedule of upcoming production. Be sure to stop by our store when you’re done here & shop for Great Eastern knives to view a large selection. You will find a variety of traditional folding knives in several of GEC’s popular handle materials such as burnt stag, natural stag, jigged bone, acrylic, & various woods like ebony, burl woods & more. Check back often for your favorite patterns. 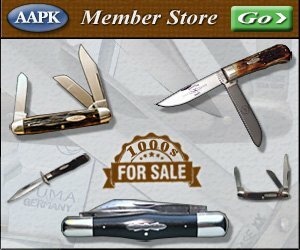 AAPK sellers often list many of the favorites from elephant toenail knives to trappers knives… congresses, whittlers, cattleman’s, Jack knives & many others… You’ll often find 1095 high carbon steel blades 440C stainless steel blades come up for sale regularly.